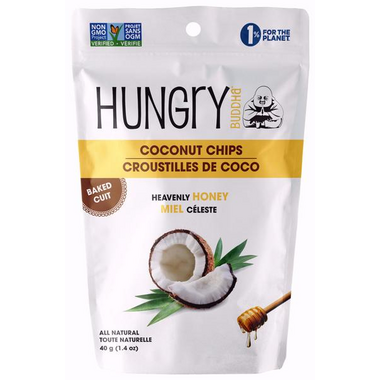 View all products by Buddha Brands Co.
Hungry Buddha has created an outstanding flavour line up of all natural coconut chips – delicious on their own or added to various recipes and dishes. Live Healthy, be happy and snack wisely. The Buddha Brands Co. is a proud member of 1% for the Planet. These are so delicious and can be used many ways. I add them on top of oatmeal, in yogurt, and mixed in with dry nuts as a snack. So good! Everyone in my household loves these! Delicious flavour. Wonderful added on top of yoghurt, granola, and fruit in the AM. Wonderful flavour! My daughter and I are both addicted. Great product, the whole family loooooved it! It's fairly expensive and there's a lot of natural fat in it but it tastes so yummy!! A bit expensive but crunchy, sweet, and addictive!